Greetings, everyone -- my name is Marcus. Despite this technically being Stefie's blog, I have the privilege of occasionally interjecting my (oftentimes hyperbolic and crass) thoughts on food and the culinary arts. A while back, after I had moved here to New York City in mid-February of 2010, I embarked on an epic quest to search for a place in the city that I could designate as my go-to spot for tea. Stefie may be a bean counter by day and morsel marauder by night, but I am a tea addict 24 hours a day, 7 days a week. Thankfully, Stefie was able to save me from my withdrawal by introducing me to a chain known as Argo Tea. 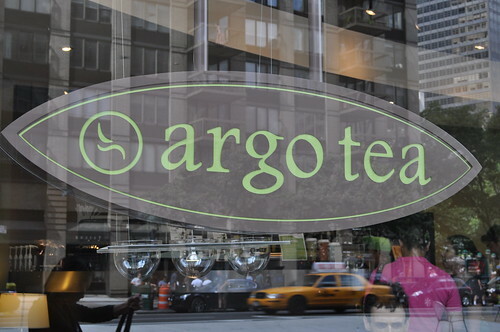 Argo Tea was founded by Arsen Avakian, Daniel Lindwasser, and Simon Simonian (what a name!) over in Chicago, Illinois back in 2003, and have since established about fifteen locations in the area. Only recently in the year 2010 did Argo expand into the New York City area with four new locations (at Columbus Circle, Union Square, NYU Langone Medical Center, and the Flatiron Building). Stefie and I typically go to the Flatiron location out of convenience, but we may venture out and try the other locations at some point. My first thought upon entering Argo for the first time was one of déjà vu. It almost felt like a brighter, hipper, less-stuffy version of Starbucks. Now, before all you caffeine-laden, bloodshot-eyed coffee fiends jump out of the woodwork at me with your pitchforks, let me first state that I have nothing against Starbucks. I frequent their vast plethora of locations often -- but I am simply not into coffee. You'll always see me ordering the chai or iced tea lemonade at Starbucks, which is almost as sad as watching the crazed, misguided man who sits down at a Japanese sushi restaurant intending to order a hamburger. Honestly, though, if I want my drinks to taste like the sludge off the bottom of worn car tires, or if I have a hankering for liquefied brick, then maybe I'll order a coffee and fit in some sleep next Christmas. But for those of us who would rather toss aside the hazelnut shackles and take a deviation from the usual choco-caramel prison, there will always be the slower-paced comfort of tea to provide delicious solace. While Argo does offer coffee, I have no predilection for it. The sheer variety speaks for itself, I think. 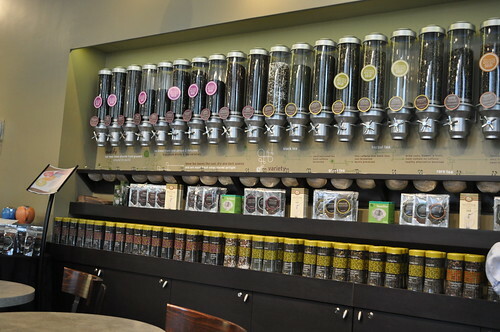 Argo offers over thirty types of loose-leaf teas. Why loose-leaf? Well, consider your average supermarket. After waltzing down the aisle, you might grab a package full of green tea teabags. After steeping the tea via your boiled water back home, you find that your green tea is tolerable but ultimately bitter and unpleasant. This is because bagged tea is, for lack of a better phrase, an insult to the human taste palette. Teabags are full of fannings which are basically the neglected, forlorn bits of tea-dust you'd find quietly sobbing at the bottom of the tea barrels/crates after the rest of the leaves have been collected. You can only get so much flavor from these fannings. Smaller tea fragments release bitter-flavored tannins more easily, whereas larger tea leaves that are allowed to properly unfurl and swirl around in water deliver the full body and flavor that we find more enjoyable. Thankfully, Argo deals with the loose-leaf varieties, so fear not the fannings! The teas are split up into two primary categories: The standard teas, and the signature drinks. The standard teas cover your basic categories of green/black/red/white/rare/herbal teas, but come in many interesting varieties such as Genmaicha, Moroccan Mist, Earl Grey Creme, Mango Mambo, Black Currant, Masala Chai, Rooibos Pomegranate, Oolong Formosa, Fruit Sangria, and Armenian Mint. The signature drinks can be seen on the large main menu when you walk into the store, and are usually specialized, custom mixtures of tea. One thing I especially like about Argo is the service. The "tea-baristas," as I call them, are very friendly and are more than happy to give you multiple free samples of any teas you wish. It takes a lot of the guesswork out of the selection process and helps ensure that you leave with something you enjoy. So how does Argo Tea actually taste? Stefie and I recently brought along Krystal, a friend, to Argo as part of a small NYC tour of sorts. The above picture is the result of what the French would call crazy impulse purchases, which is apparently something I have a history of doing when it comes to the impossible constructs of choosing between one amazing flavor and another. I ordered one medium-sized, hot signature drink and four additional medium-sized, iced signature drinks: the caramel-flavored black-tea soy Teappuccino (as seen in the middle in the above picture), the Carolina Honey Breeze, the Pom Tea, the Maté Laté, and the vanilla soy chai. The Teappuccino and vanilla soy chai are my two personal favorites that I seem to find myself going back for every time I visit. The Teappuccino can be made with other tea bases such as Earl Grey, or other flavor-mixes like coconut. The flavor is very strong and unified, and yet not without its discrete components. You can easily taste the sweet tinge of caramel intermixed with the bold punch of the tea itself, which provides a nice balance of tastes. One usual complaint I have about most tea joints is that the hot teas are so hot that I have to wait indefinitely for whatever nuclear reactions are happening within my cup to ultimately cease so that the drink is suitable for human consumption. 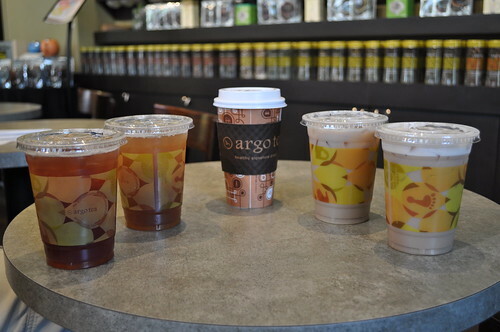 At Argo, the hot teas are indeed hot, but not so hot that they're undrinkable. For someone like me with a somewhat temperature-sensitive tongue, this is a huge relief. Stefie usually gets the iced vanilla soy chai. It's one of the most intense chai teas you'll find, delivering a very concentrated rush of cinnamonesque spice. Chai by itself is a great flavor, but I think it's difficult to pull it off properly -- either the milk ratio is off and causes the drink to feel too thick/frothy/bland, or the drink is so cold that it feels almost sterile in taste. Argo has clearly spent a lot of time optimizing their chai, because the temperature is just right, and the flavor is ever-present. The Pom Tea, however, is the outlier of this quintet. Upon sampling it, something happened. An electrical impulse fired off somewhere deep within the circuitous cavern of my memory banks and brought forth -- to the tip of my brain -- experiences from my earlier college days that I had long since forgotten. Only a single word manifested itself within the confused network of uncomfortable memories: Vomit! The Pom Tea had a sort of bitter, astringent, dull acidity to it that I can only describe as the aftertaste one feels while praying to the Porcelain God. I'm not sure how Argo dropped the ball here, but to date, this is the worst tea I've tasted at this cafe so far (although I also dislike the Mojitea and the hibiscus chillers). Why I didn't bother sampling it first is beyond me. In terms of the iced teas, I much prefer the Carolina Honey Breeze, which is basically honey in liquid, iced form. It's fairly addicting and has a brilliantly sweet aftertaste, but it's nothing to write home about. Finally, there's the Maté Laté. It's very similar to the vanilla chai, except it carries more of an almond-like flavor. It's practically a tossup when it comes to which one is superior to the other -- they're both very good depending on your mood. 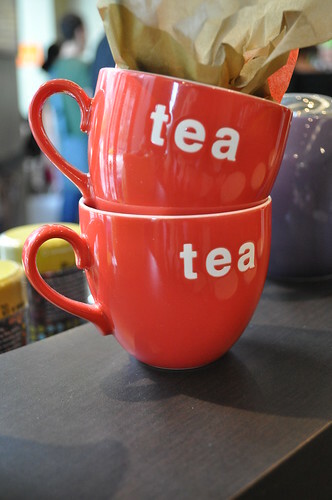 For those who like merchandise, Argo has plenty of mugs, cups, tea infusers, and teapots to choose from as well. Findings: Generally speaking, Argo Tea is a wonderful place to stop by if you're feeling the craving for some decent loose-leaf tea. 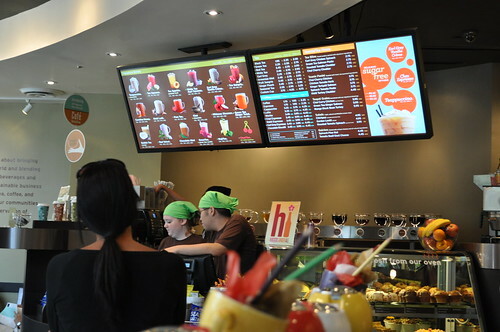 It's a very open, well-decorated environment with a more relaxed pace when compared to places like Starbucks. Stefie and I can't seem to stop making return trips here (I have the "Argo LoyalTea" card that grants me a free tea after 10 tea purchases, and I'm pretty sure I've clocked well past 40 by now, based on the number of free drinks I can recall). It's a fun place to chill with friends, study, or just relax. There are more than enough varieties of tea to keep you well-occupied for a while -- so check Argo Tea out if you get a chance! Not everything will be up your alley, but there will undoubtedly be a few tea permutations, at the very least, that just click for you. Price point: $3.95 for each medium-sized drink, $0.50 additional for soy milk. nicely done, sir. the argo in union square is right around the corner from school for me and i've been there a few times. i've also squatted at the flatiron argo in a sad attempt to study. i have actually hated pretty much everything i've purchased there. i forced myself to take a few sips of the iced earl grey vanilla creme before giving up and throwing it out. the mint moji-tea was pretty painful too. their little rice bowls are also quite terrible, but i guess i can't be too critical of a tea cafe's food. i stopped by this afternoon for regular iced earl grey and it was pretty good. i think i need to keep it simple. sorry for the long comment - i've been thinking about argo a lot lately because i like the store but haven't been able to find the perfect drinks yet. i'll definitely stay away from the pom, ask for a few samples at my next visit, and maybe check out their chai. I agree with you about the Mojitea. It's way too minty and strong for my tastes. I expected it to have a sort of citrus-like quality to it, but it doesn't taste the way it looks. The iced Earl Grey is delicious, though. I actually haven't delved too much into their regular teas just yet, so that is definitely on the to-do list. But out of the signature drinks, I'd stick with the Teappuccinos, chais, Earl Greys, Honey Breezes, Mate Lates, and possibly the bubble teas (which are quite popular at Argo, but I've yet to actually try one). Stefie also liked the Tea Sangria, but it's not as good as what you can get elsewhere. I suspect that the regular teas are ultimately more fulfilling than the signature drinks, though.